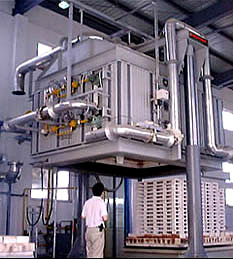 FOR FIRING, SINTERING, BRAZING, ANNEALING AND OTHER HEAT TREATMENTS. 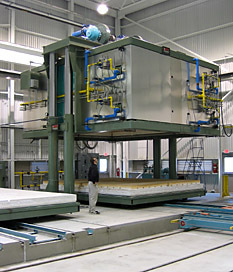 When do you need a flexible heat processing system for ceramics, metals and glass? Usually, whenever your application requires a system thatwill provide a high degree of temperature control and uniformity, yet adapt quickly to a variety of different heating cycles and productivity requirements. 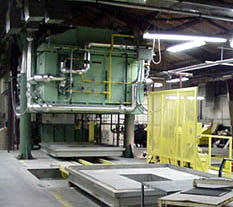 UNIQUE/PERENY Bell Kilns and Furnaces are routinely used for firing, sintering, calcining, brazing, annealing, metallizing, andother heat treatment of a wide range of products at temperatures from1000o F up to 3100o F (1700o C). With programmable microprocessor basedcontrols, regulated heat input surrounds and penetrates the work load toprovide both temperature control and uniformity. This is especially important when your work cycle requirements vary from extra dense loadslike tightly packed small items to large, heavy, ceramic, glass or metalparts. The Bell’s fast heatup and rapid cooling capability makes possible more flexible work schedules, manpower reductions, and higher productivity. Another clear advantage of the Bell is that it eliminates doors and provides a well sealed energy efficient enclosure that promotes more precise control of the heat process. In addition, the bell envelope is easily raised and lowered with a motorized lift mechanism that is designed for vibration free movement, even when stopped or started atany point of travel. Complete access to load or unload product quickly is possible because the car which also serves as the bell hearth can be rolled clear of the raised bell envelope while another car is set in the firing mode. Additional cars for greater productivity and various muffle retorts for atmosphere work are available optional accessories. Heavy steel case and superstructure, welded and reinforced to form an integral unit with attractive exterior finish. Durable, high temperature ceramic lining backed with energy efficient, graded, multilayer insulation. Low thermal mass car hearth with perimeter heat seal, heavy duty wheels and track extension. Amply rated, long life heating components surrounding the work area for maximum heat transfer and temperature uniformity. Motorized Bell envelope lift mechanism designed for vibration free movement and stop-start operation. Microprocessor based temperature controls with fail-safe over temperature protection. Control panel completely wired with necessary power supply, switches, meters, lights, relays, fuses and other UL/CSA listed components. Comprehensive operation and maintenance instruction manuals. Completely factory inspected and shipped ready to install and use. Product technical support, service and spare parts availability. Multiple temperature zone control systems. Adequate building and foundation with clear access for installation. Utilities necessary to operate equipment satisfactorily. Installation of equipment in accordance with rating plates, instruction manuals and applicable codes. Exhaust hoods, ducts, vents and interconnections safeguards as may be required by codes or insurers.